Whether you have just brought home your first pet, or you are a seasoned and experienced owner, you want the best food you can get for your pet. One look at the number of options will tell you that it isn’t a simple decision. There are several factors that can play into selecting the right food for your pet. If you have multiple pets, you may find that one-size doesn’t fit all. SIZE: A Great Dane has a very different set of needs from a Pomeranian. Large breeds are known for shorter life spans, while tiny breeds tend to live longer, and although they are prone to issues related to poor breeding, they generally outlive their larger counterparts. Be sure your pet’s food matches its size requirement. Larger dogs have much different health and wellness needs than smaller dogs. PURPOSE: Did you bring your pet home to be a companion, dwelling an in apartment, or do you intend to give your dog a job, such as livestock guardian, hunting pal, or shepherd? Are you showing or working your dog in agility? Likewise, with cats, there will be different nutritional needs for the cat who lays in the bay window versus an outdoor cat who is more active. Make sure the foods and treats you provide match the needs of your pet. ACTIVITY LEVEL: Is your pet a couch potato like the Afghan Hound, or an extremely driven hunting or herding dog whose activity level is in the hurricane status? Obviously, a couch potato needs a much lower calorie intake than the bouncy Jack Russell or an Australian Shepherd going full speed all day. Be sure your food choice is going to fuel the energy needs of your pet. AGE: As your pet ages, his needs will change. A puppy in his growth cycle needs more nutrition than a mature dog maintaining his weight. A senior dog needs help maintaining sight, focus, and dealing with conditions of aging. Select a food that is age-appropriate for the best results. Aging dogs may even needs supplements to help with things like dog arthritis or hip dysplasia. HEALTH: Like all of us, our pets often have health issues which we must work through. Food sensitivities and allergies may show up. Dogs and cats may have diabetes, skin conditions, kidney conditions, and other reasons for choosing certain foods and supplements. 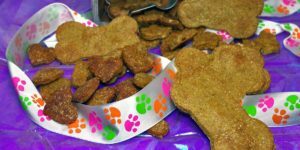 My Happy Dog 123 offers healthy options for treats to help ease certain aliments your pet may be experiencing. Read our “About us” page to hear the story of Truman and how changing his food and treats changed his life. REPRODUCTIVE STATUS: A female who is nursing puppies or kittens will need about triple the nutrition of a spayed female or neutered male. PREFERENCE: Although we don’t place the same importance on the pet’s preference, it is impossible to get nutrition into a pet who won’t eat the food presented. Where possible, take the pet’s choices into consideration along with the other factors we have presented. You pet needs a nutritious diet that is also healthy and delicious. Finding the right food is invaluable in protecting the health of your pet. A well-nourished pet will be able to fight disease and illness better, will be more active and alert, and will be your companion for many years. If you have questions, be sure to discuss your concerns with your vet. You may also direct your questions to us, and we will do our best to assist. Fleas and How to get rid of them!